Our time in Cusco was wonderful, we learnt a lot and experienced the Inca culture. But we were craving for more! As we had agreed to visit Machu Picchu by ourselves, i.e., no tour, we planned our next few days ahead carefully. We decided to slowly make our way around Sacred Valley before ended our adventure at Machu Picchu. Sacred Valley is an Andean Valley along the River Urubamba. It is famous for housing some famous Inca Ruins including Machu Pichu. The Incas used the valley for farming and rituals and their imprint is very obvious in the valley. The valley can be accessed by signing up for day tours from Cusco and making your way there using public transport, read collectivos. The cost of the tours range from 20 to 50 Soles. While it makes the journey easy and provides a guide, the ruins are packed with tourists. In our case, we did one tour but then decided to visit the valley by ourselves to soak in the culture. We signed up for a bus tour to Pisac, Ollantaytambo and Chinchero. These are some of the well known villages with Inca ruins. The tour was supposed to start at 9am, finish at 7pm and it included lunch. To top it off, it costed us Soles 50 each, USD 15.6. Really cheap! Our first stop on the bus was a local market as we entered to the valley. We walked around and bought a few souvenirs. 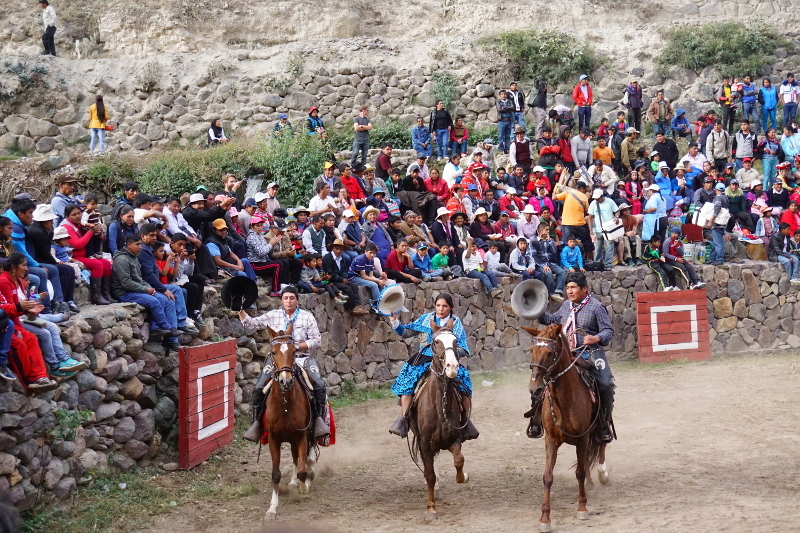 The next stop was the Pisac Ruins. 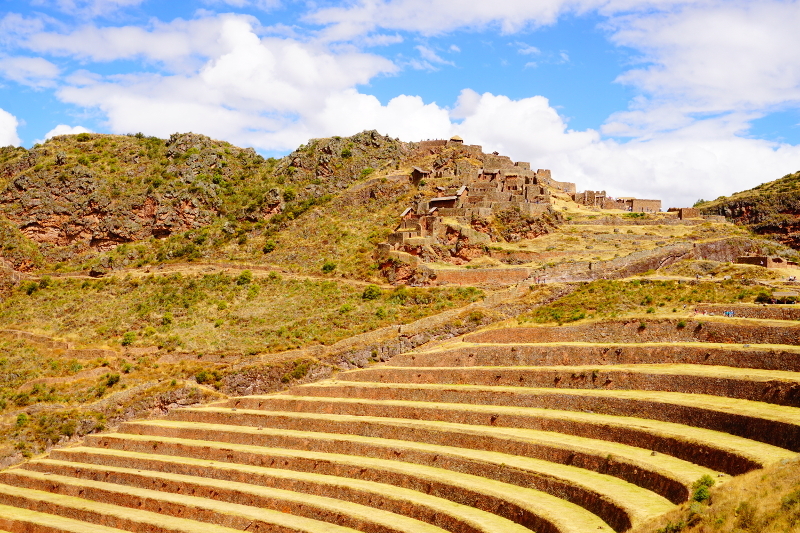 The Incas had built a farming village on top of a mountain. Not only were the views incredible, it was a remarriage effort to build the ruins so far up. There were several levels of the ruins used for housing as well as temple. The ruins were packed with people but we managed to walk around and enjoy the scenery. Next we stopped at a silver jewelry store before lunch at a buffet restaurant. The jewelry store had a small tour of the silver jewelry and how theirs was the best jewelry. 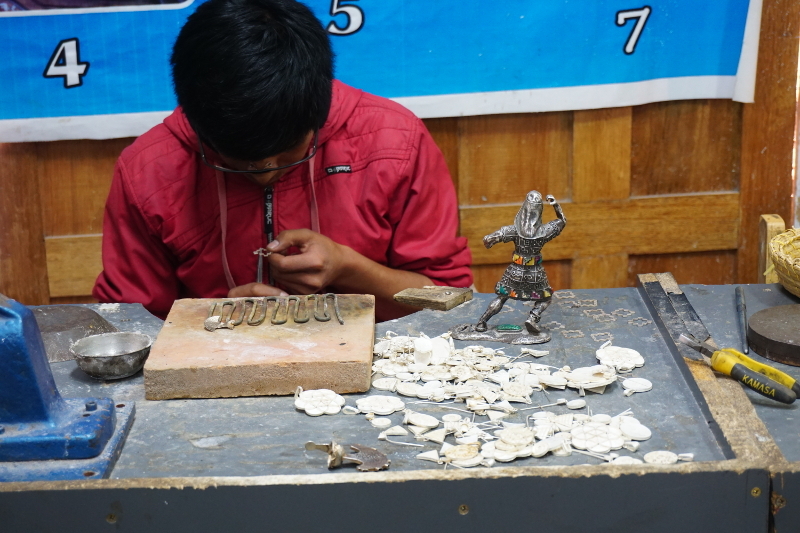 We spent some time viewing but the prices were exorbitant considering we are backpacking and on tight budget. Moving on, we stopped at a massive building for buffet lunch. The spread was brilliant and there was a live band. 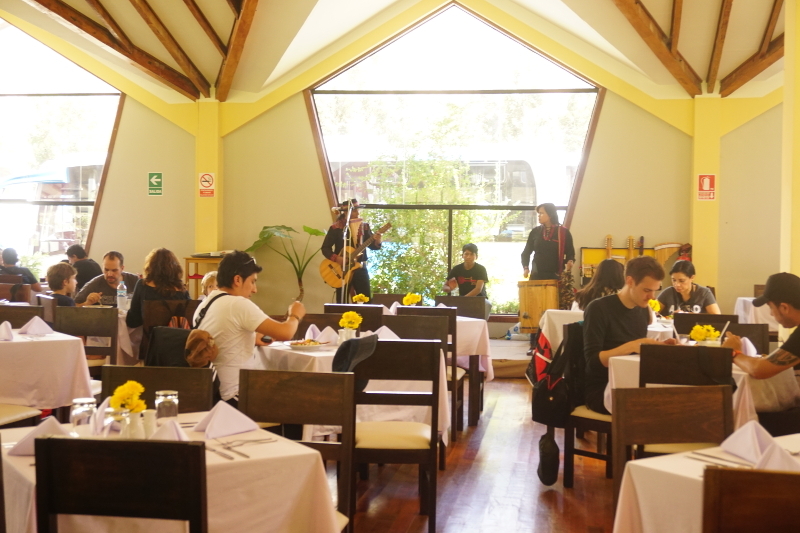 We were amazed at how they could have a tour for 50 Soles where the lunch alone would be possibly 30 soles per person at least. Anyway, we filled ourselves with delicious mains and amazing desserts. 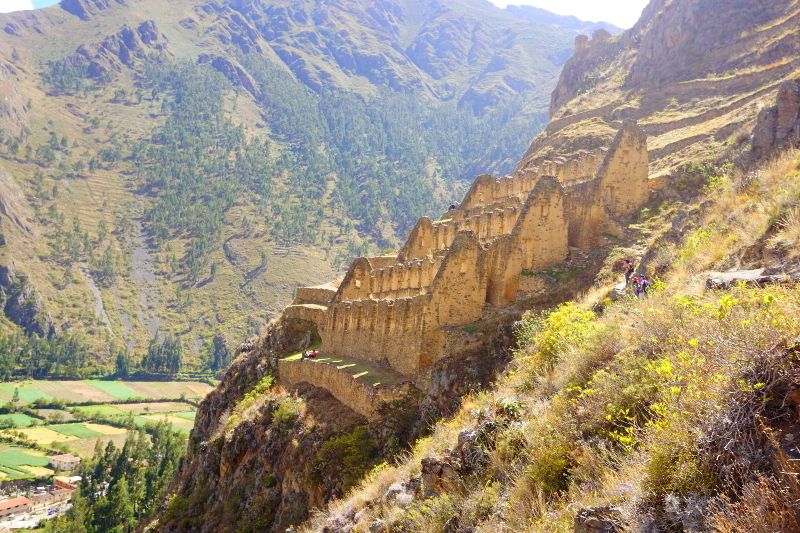 Soon after lunch, we headed towards Ollantaytambo, one of the most significant villages in the valley. We reached there around 3 pm and we were to leave at 4pm sharp. From the outset, we were impressed by the town. 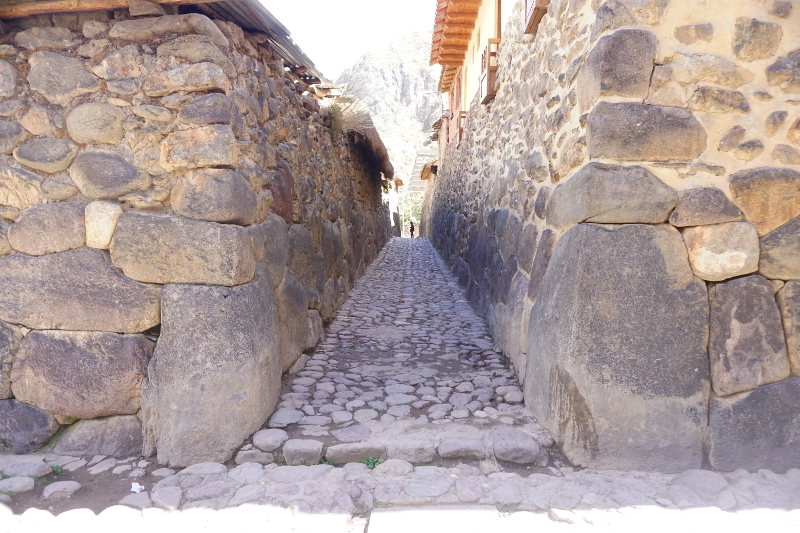 The streets and houses were still from the Inca times though they had been paved over and added into the colonial style. 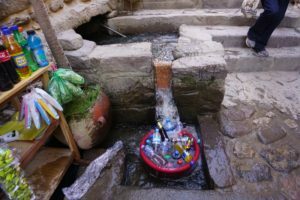 The water engineering from the Inca times was still functioning perfectly well. A lady selling drinks had her drinks bucket sitting in the Inca water channel to keep them cool. That’s a brilliant way to keep the greenhouse gases down. The ruins were incredible too but there were two problems, stairs and crowd. As we had a guide with us, we didn’t want to lose the group but that was impossible with a humongous crowd and multiple guides. Eventually, huffing and puffing up the stairs, we found our guide who told us more about the ruins. As with all the Inca Ruins, there was corn production and storage but the Incas had also used this location for astronomy. They studied the stars and Sun positions. The Sun temple was brevet fished here but the ruins were still immaculate and still in good shape. We would be back again we decided! On the way back to Cusco, we visited Chinchero which was only excavated not too long ago. The highlight was a church built over the Inca temple (as with many churches). The church was similar to other churches in the region made of rocks while the foundations sit over the Inca temple. Some locals observe both religions and celebrate the Equinox grandly. 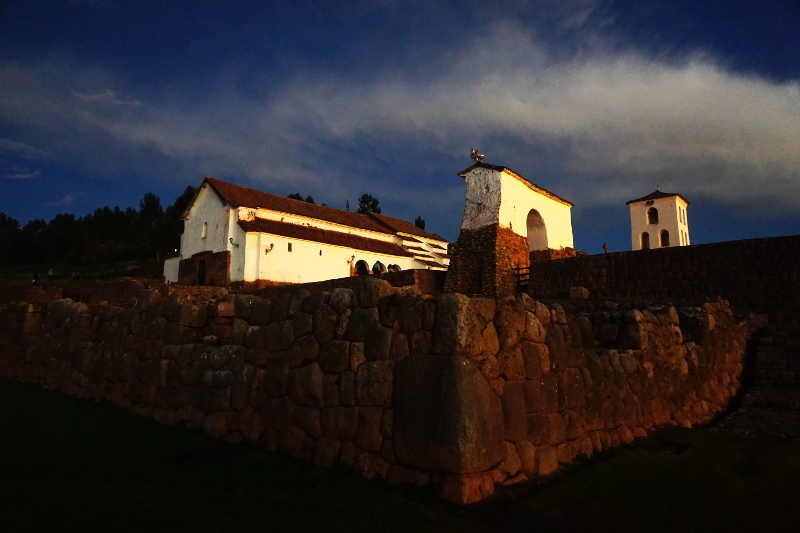 Additionally, the beauty of Chinchero is that the site looks over the clear range of the Andes. The tour ended just at it began at Plaza San Francisco around 8pm. We decided to see the Sacred Valley for ourselves once again. 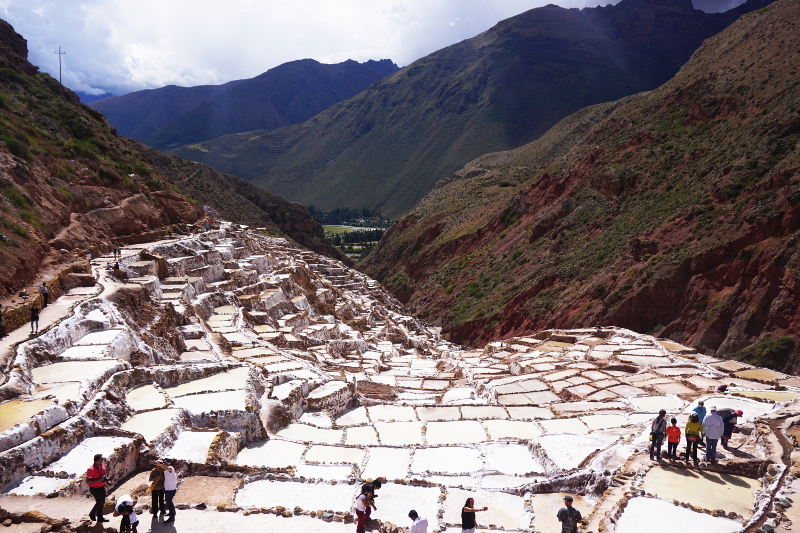 The Maras and Moray tour from Cusco is usual for 20 Soles, USD 6.25, for half-day, but we chose to do it our way. We took a collectivo going from Cusco to Ollantaytambo. The driver asked where we wanted to go and we told him Maras and he assured us that he will drop us at the main road. The ride was scenic for most of the way after Cusco. The Andean cordillera was visible throughout the journey. 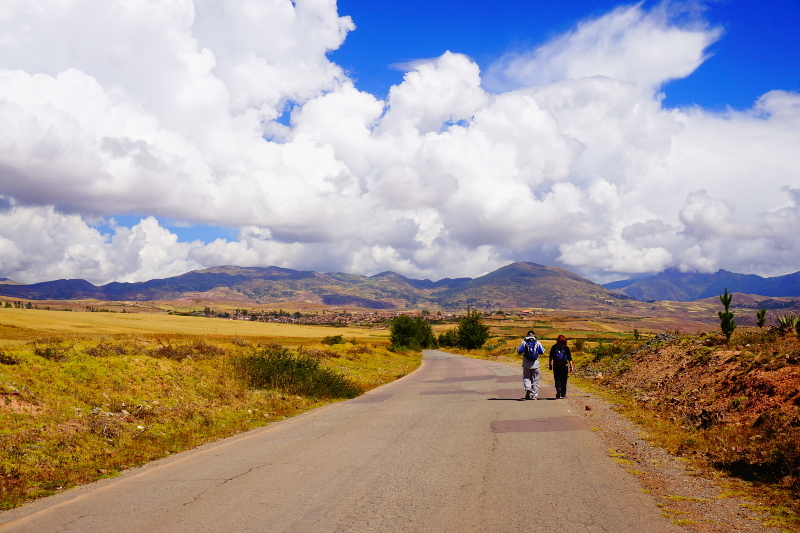 As promised, we were dropped off at the main road outside the village of Maras. Taxi drivers told us they would take us on a tour for 15 Soles. We opted not to take the offer and decided to walk instead. An Argentinian Couple also decided to do the same and we struck up a conversation. At around halfway during the 6km walk, we saw the sign for Salineras de Maras and decided to go our own way. The walk to the Salineras was picturesque. The road was hilly mostly downhill with wheat farms next to the road. Occasionaly, a bus, car or quad bike would pass by and create a dirt cloud. As we reached closer, we arrived at the final hill over the salineras. The view was remarkable! White salt mines against the brown hills were a sight to remember. Unfortunately, we had to walk 2km to get close to them. Once we arrived, we noticed all the cars parked and the tour buses. The mines were packed. We had our tourist ticket stamped and finally got close to the salts. The mines were huge and there was no way that we would be able to walk them all. We photographed the mines from close up and with selfies and returned to the entry. We didn’t feel like walking the uphill to the village so we negotiated with a car driver to take us for 10 Soles. He tried to sell us a tour to Moray along the way but we weren’t buying. The village itself was quite small. There was nothing there really except a quadbike shop which ran tours to Moray and Salt Mines. We had lunch with 2 huge glasses of Chicha while there and chatted with some old native ladies about they’re village. 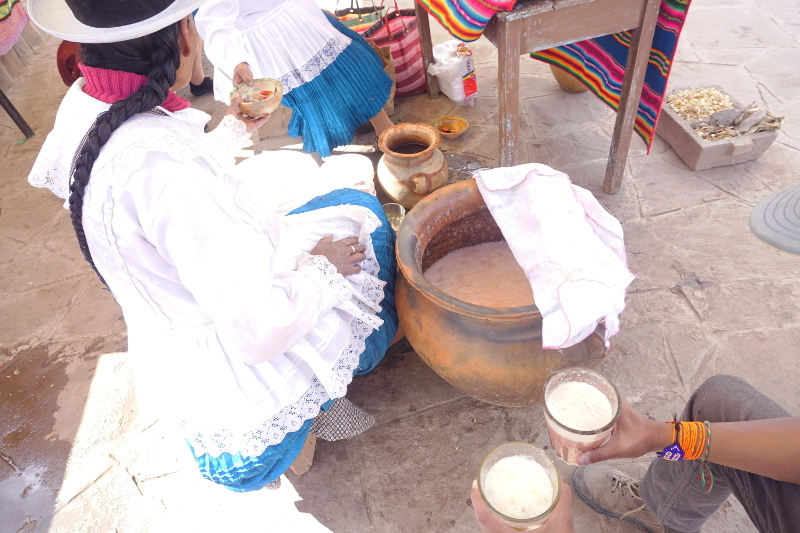 Chicha is a corn beer popular in Peru. It is quite cheap and usually made at home. We took a cab from Maras to Moray for 13 soles and the cab driver assured us that there is a trail back to Maras. Moray was an incredible place. It looked right out of a M Night Shyamalan film. 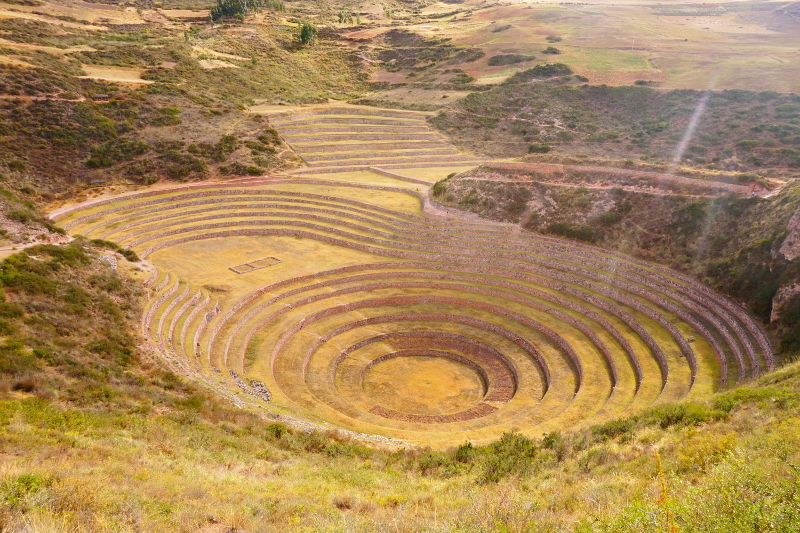 Incas had farmed here by making circular step terraces going 5 stories down. 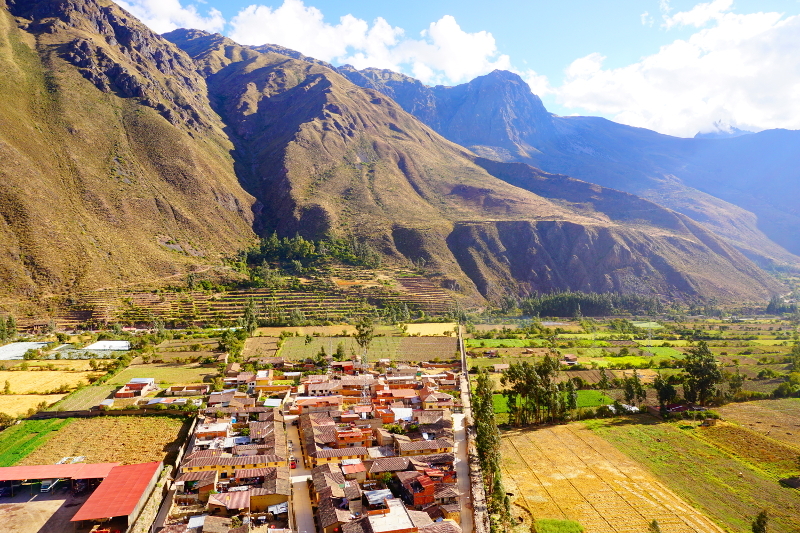 We had seen the farming terraces in Ollanta and Pisac but this was something unusual. We hiked down to the lower levels and it seemed amazing that somebody could do this without modern tools or load carrying animals. 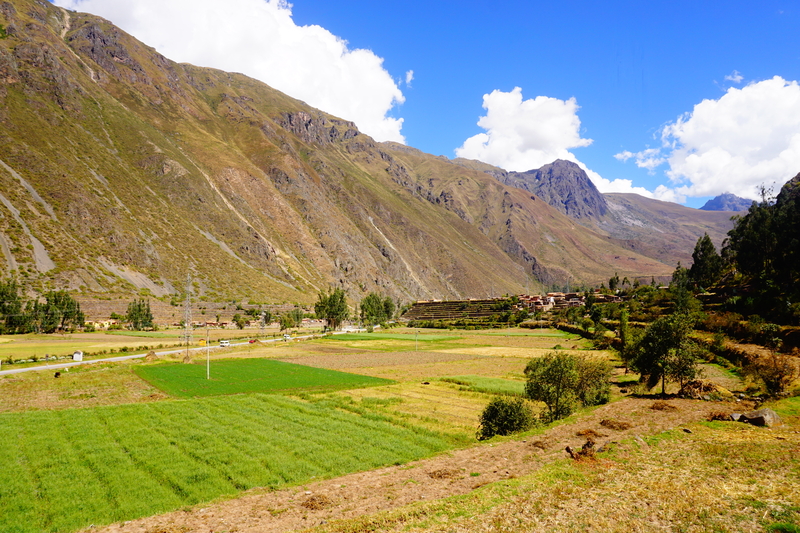 We napped on the green grass before hiking back to Maras and eventually took a collectivo to Ollantaytambo. As mentioned previously, we liked this little town and wanted to return. After Moray, we shopped around for a hotel and then went out to eat. We noticed a huge crowd and hawkers in the main square. After speaking to a few locals, we learnt a fiesta was starting the day we arrived. We grabbed a seat in a balcony overlooking the whole thing and orders food and drinks. There were a lot of dances, dancers in different costumes and fireworks. 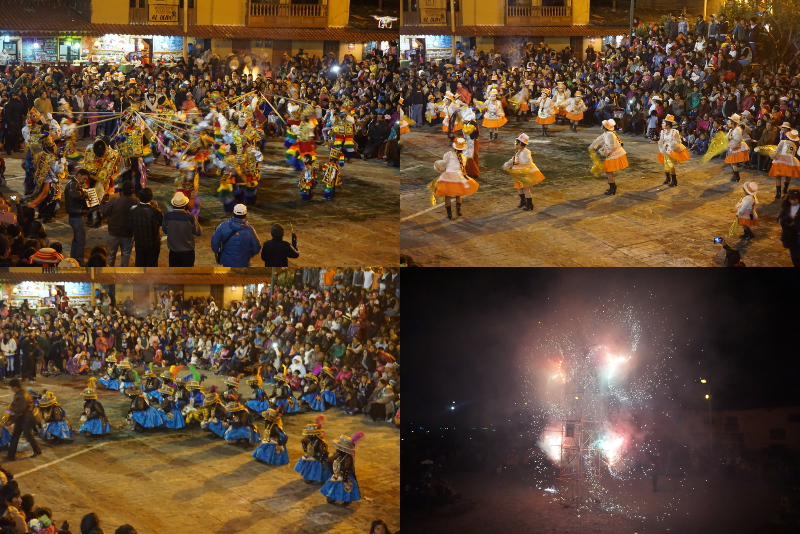 It was more local than Copacabana, Bolivia where the fiesta had people from all over the country. There was an Indian-style burning of a wooden structure with fireworks. As the fireworks popped, a banner of Jesus unfurled from the top. It was a fun and lively event but concentrated on religion and culture instead of drinking and partying. 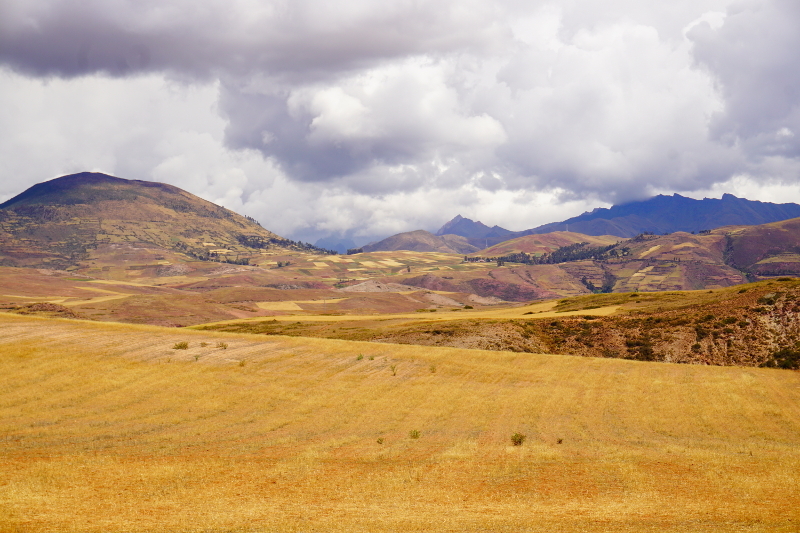 The next day we hiked up the hills of Ollanta and visited the free ruins in town. The ruins were granaries which have survived till today and if there were renovations, they could still function as modern buildings. That may give an idea of the amazing Inca architecture. Further into the day, we walked on an actual Inca trail. The trail once connected Urubamba and Ollantaytambo. 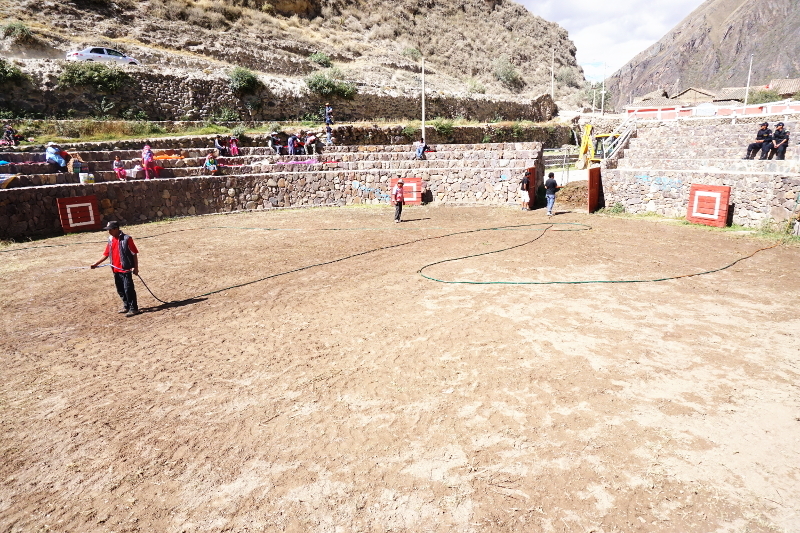 The water channels made by the Incas are still functioning and providing water to the farms. 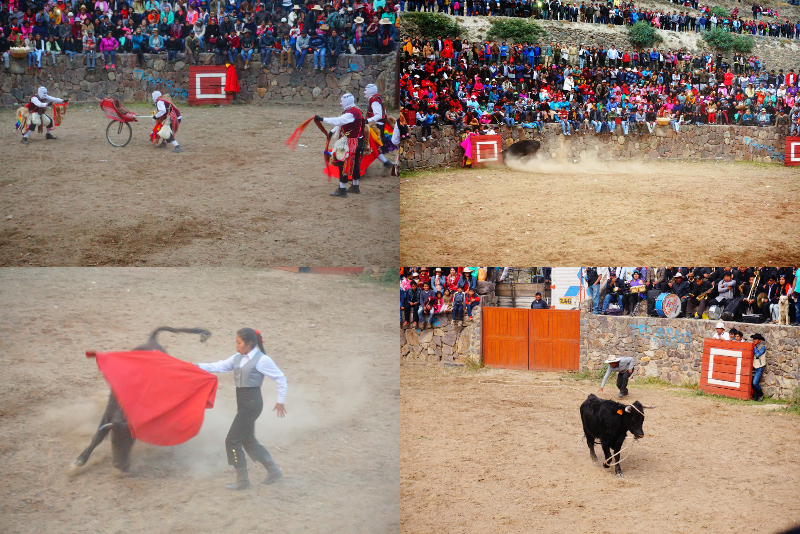 The highlight of our visit though was the Bullfight or Corrido Del Toros. We heard the previous day about the bullfight in the fighting ring in San Isidro. The time of the bullfight was meant to be 3pm but the rings in village are tiny so we thought we would get there by 1pm. We did so and there were only a handful people there with most seats empty but people “reserving” by leaving tarps on seats. Anyway, we waited and waited as the skies threatened to pour. Around 3pm, the crowd started pouring in. We grabbed some popcorn and beer to kill time. We waited some more and had another beer. Around 4pm, the VIPs and the band came in. The fight wad about to start! The matadors came out to cheers including a female matador. We had been expecting two bulls fighting each other. However, we realised that wasn’t the case and then the fear that Gosh! They will kill bulls infront of us. We waited nervously. The first bull was lowered from the truck into the ring. He charged hard and fast but the matador was experienced. 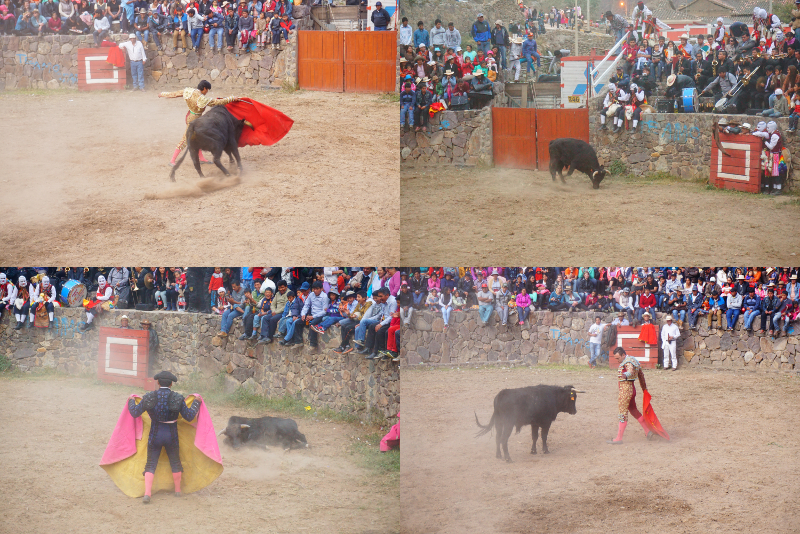 Thankfully, the matador only showed his skill without killing the bull. The next bull wasn’t interested in fighting but the organisers annoyed him into running into the ring. He didn’t do anything at first but then ran hard and angry. He caught the matador off guard and then THUMP! The matador flew a little off the ground. The crowd gasped! He’ll be carried off for sure, we thought but true to the spirit, the matador got up after the jester and other matadors ran to divert the bull’s attention. Finally, this matador “defeated” the bull. The bull stood there angry and tired. A win for skill against brute force! 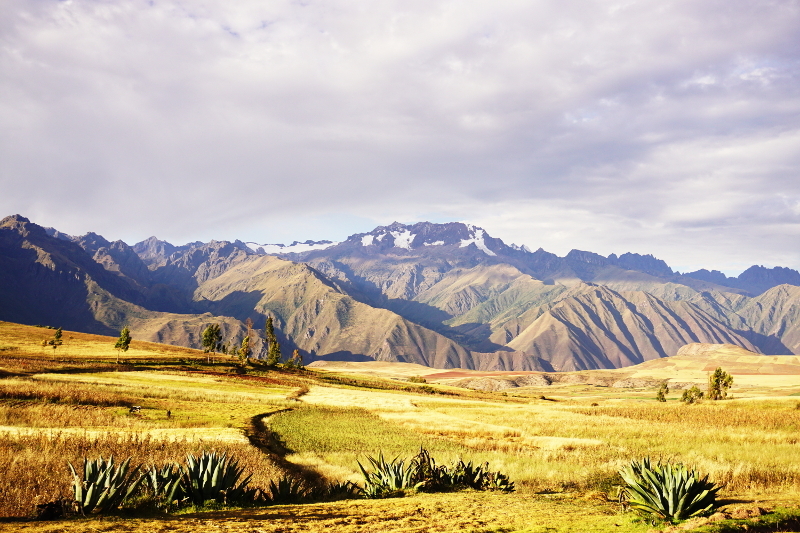 The Sacred Valley is an amazing place to spend some time away from the touristiness of Cusco. 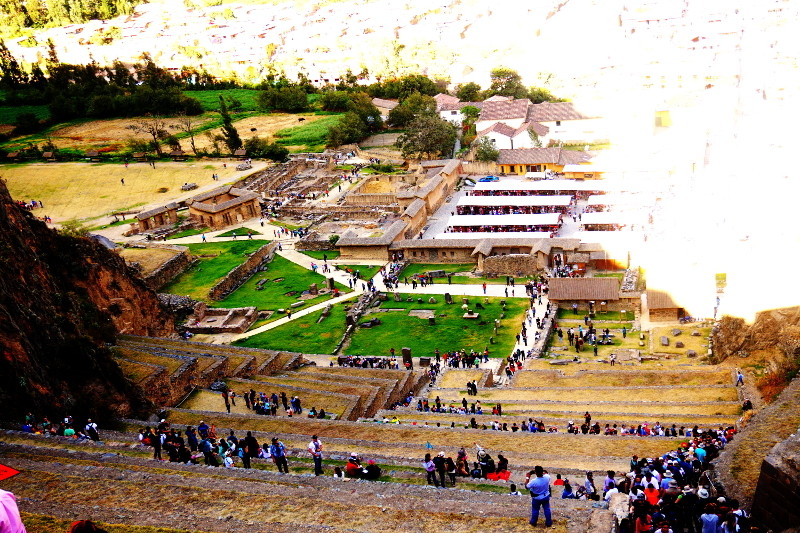 It is the actual Inca City promised but never delivered by Cusco. The people still speak Quechua and drink Chicha. In fact, we paid more for hiking in Maras than needed but we got some incredible shots of the region away from tourist roads and also helped local taxi drivers who are too far away from the McTour companies of Cusco. A great trip! Hi Ross, Thanks for dropping by! We are just trying to capture our experiences. At the moment we don’t have any guest posts but if at all we head in that direction, we will let you know. Cheers!